There’s a train coming to Durantown, bringing faces nobody has seen here before. Who are they? Gunslingers? New workers? Beautiful women? And why have they travelled here, to the God-forsaken end of civilization? It will not be easy for them to get into the lives of the workers, but that might make it all the more interesting. Garry comes to Durantown with his partner Emily McGraff – to try and get work as a labourer, and also to pursue his own goals. In the town he’ll also meet a few of his old acquaintances from his wild life when he was for example a traveller. With his goals and contacts he needs not fear to stay idle. Garry is a slightly mysterious character who can’t be specified much further. He is good for a player who wants to primarily solve a significant personal goal, stir up things in Durantown as a man from the outside, and doesn’t mind a character who’s not exactly the good guy. Known also as Wild Bill Hickok. A renowned marshal from Rock Creek who tackled many an outlaw band in his life (including the infamous McCanles gang). He’s a bit of a Wild West celebrity. He’s come to Durantown after a friend from war invited him to talk about joint business. As a soon-to-retire marshal he’s also interested in the railway construction. Because of his reputation of fighting crime he becomes a welcome sight by some, who would like him to give his advice regarding the upcoming election of new sheriff and concerning security matters. But men like him have many friends and enemies… This character’s game will be very much about solving external conflicts and intervening in others’ problems. He also has his own problems that come from the past. The first female detective from the Pinkerton National Detective Agency is obviously an experienced and elegant lady who can use all kinds of feminine weapons. Despite prejudice she’s one of the best agents, owing to her powers of observation and the opportunity to get information from sources which are not available to her male colleagues. She comes to Durantown because of training (the environment of Hell on Wheels is very suitable for that) of her young colleague William. But he’s been mostly causing problems for her. The player of this character can look forward a significant detective plot as well as internal issues of for example her view on justice. The character indirectly follows the role of Cornelia Darling impersonated by the player in the first half of the game. A young girl who’s recently come to Durantown with her partner Garry Hawkins to find work. At first glance it’s obvious that she’s no sissy, though she tries hiding her sharpness under a pretty face. She acts nice and tries to be everyone’s friend, but there’s something unpleasant in her smile. Her proper lady routine is also slightly disrupted by the fact that she likes to drink with men. And not just drink. When she’s drunk she has almost hysterical fits, switching between rage and tears. Only very few people know why. Emily McGraff is a tragic character with a clearly given goal, mission and a pre-scripted finale. She can be approached very dramatically, but she can also give inner experience. From about half of the game this character is followed by the role of Nellie Bly (see below). A brazen newspaperwoman who work as an editor in Pittsburgh Dispatch. She comes to Durantown because she’s received a tip that the famous Bill Hickok will be coming here and she’s like to interview him about his past achievements. She also heard about the problems with Indians, which might be another great story. Nellie is obviously an impertinent woman who doesn’t mind manipulation and lies to achieve what she wants. However, she always has a good reason for that and she certainly doesn’t mean to harm anyone. On the contrary. A character about losing slightly childish illusions about the world around the railroad, about Indians and heroism. The character is very communicative, but she also has strong storylines which offer inner experience. In the first half of the game the player will play the character of Emily McGraff (see above). Will is known as Buffalo Bill by some. 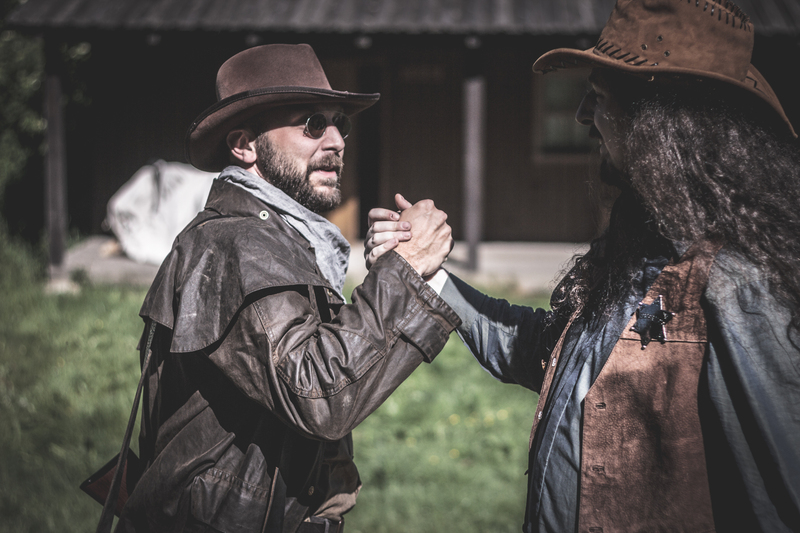 He is a hunter and a buffalo meat merchant and he has various reasons to come to Durantown (the official ones are to meet his old friend James Hickok and to agree on supplying meat for the workers with the company). Buffalo Bill is an extravagant, far-fetched figure who likes to tell stories and exaggerate his adventures. But he’s also a capable trader and hunter who most deal with personal problems. The character will be in the middle of things, he’s oriented towards negotiation and he gives a lot of space for dramatic scenes. He also offers a strong (though partly tragic) personal story. Before this character, the player will have the role of John Perkins. The son of Allan Pinkerton, a founder of the renowned Pinkerton National Detective Agency. His father is trying to get him engaged in the family business, so he came up with the idea to send him with Kate Warne into the wild environment of the emerging railway town to help him gain experience. William didn’t take much after his father and he prefers drinking, good-time girls and gambling before detective work. He makes a lot of problems for himself and when he gets to solving something, he’s often reckless, lacks the necessary observation skills of a detective and he tends to deal with matters in a bit more… straightforward way than he should. A character focused on playing out with a strong relationship with Kate, and dealing with detective work, responsibility and freedom. The player of this character will have the role of Patrick O’Brian in the first half of the game.